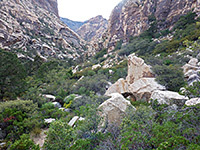 Like several other major ravines emerging from the Spring Mountains in Red Rock Canyon NCA, including Icebox Canyon and Pine Creek, Oak Creek Canyon is reached by a relatively short and easy trail, initially crossing flattish, open ground, then becoming somewhat steeper and more overgrown as the drainage approaches. 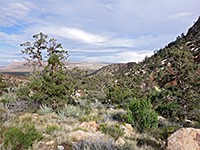 This canyon is visited less often than the others, however, since the trailhead is reached by a short, bumpy, unpaved track rather than the paved highway. 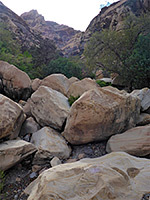 The advertised distance of the Oak Creek Canyon Trail is 1.1 miles, but this is just to a viewpoint at the wide mouth of the canyon, from where a unofficial but well enough defined path continues in the same direction for a third of a mile, to the boulder-filled streambed, which can be followed for nearly another mile. 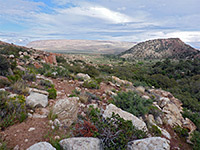 The hike starts from a parking lot at the end of a 0.7 mile gravel road forking off near the south end of the scenic drive, 12 miles from the visitor center. The initial section is an easy walk on a straight path over gently rising, sandy or stony ground, past such typical Mojave desert plants as yucca, opuntia and cholla. The first of two junctions is reached after 0.7 miles, with an equally well-used cut-off trail that heads due east to an alternative start point along the main road (Hwy 159), allowing the canyon to be reached without paying the entry fee. 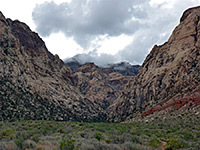 The second, not far beyond, is a four way intersection; north is the Knoll Trail which links with the adjacent drainage of Pine Creek, while south is a short connecting route to the Wilson Pimple Loop, a circuit of a low hill on the far side of Oak Creek. The onwards path is not signposted, but its destination is obvious; ahead, the canyon is now close by, a typical Spring Mountains drainage between tall, dark, sandstone cliffs. The path becomes a little steeper and rockier, climbing slightly to a minor ridge followed by an area of red earth, as the streambed comes close by to the south. A viewpoint marks the end of the official trail, just as it bends south and links with another, parallel route, an old vehicle track, that runs closer to the drainage. Beyond here the land is more overgrown, as the unofficial trail continues - cairns mark the course, rising some more and winding between many large boulders before descending and eventually reaching the main streambed, which is filled with big rocks in various muted colors. The canyon narrows not far ahead, and divides after a quarter of a mile; the main (right, or north) fork remains relatively easy to follow for over half a mile, to the base of a sloping dryfall. A small stream flows in wet weather, creating pools and cascades.